Hiya, friends! 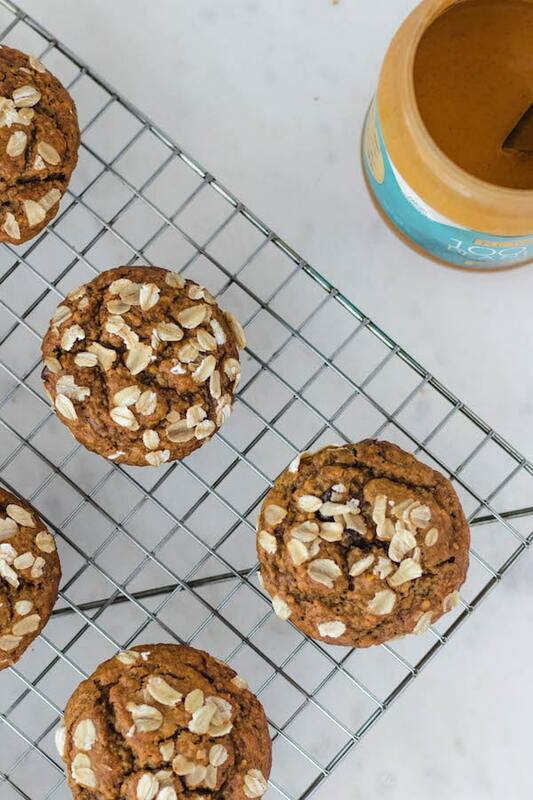 Boy do I have a doozie for you this week, FLOURLESS BANANA OATMEAL MUFFINS. I don’t know why, but it seems when the weather changes I always want to bake muffins. I made these pumpkin muffins and these gluten free lemon blueberry muffins both in the fall and spring. Sean and I are getting ready for the big move to Grand Rapids and I’ve been Spring cleaning like a crazy person. That includes going through the kitchen cabinets seeing what we have to use up. Anyone else have massive amounts of rolled oats? I bought some from Costco awhile back and can’t seem to use it up. 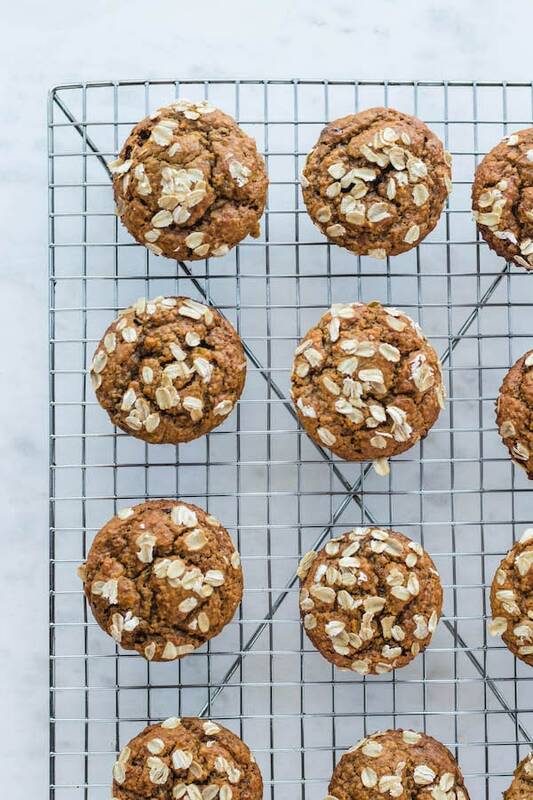 Enter flourless banana oatmeal muffins. Alright, although there isn’t flour in this recipe, you do grind the rolled oats down into almost a flour consistency. 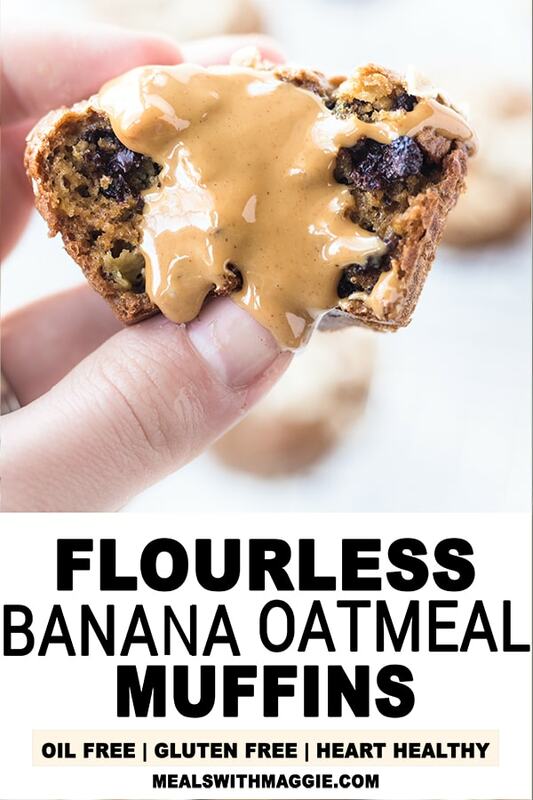 I wanted to create a flourless banana oatmeal muffin recipe that required no special ingredients that can often be pricey. Also oat flour makes baked goods more moist than wheat flour. So I try to use it when I can. 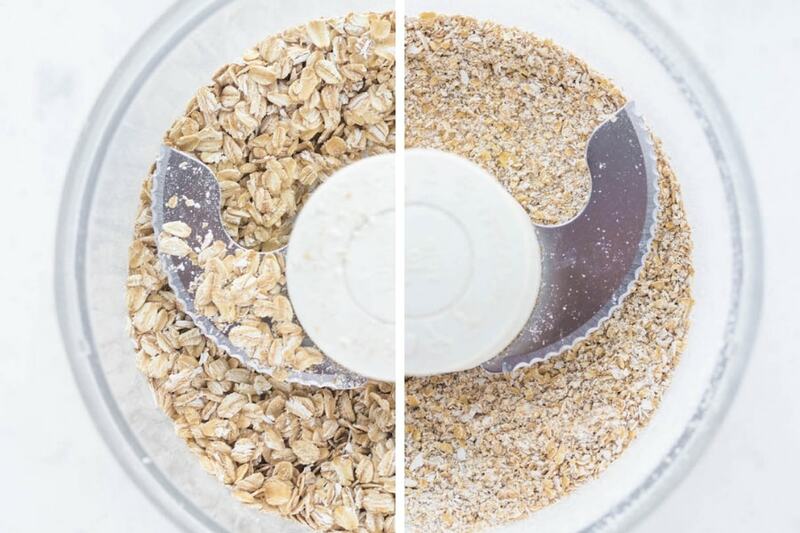 Pour 1 cup rolled oats into a food processor. A blender could also be used, but I find the food processor does a better job at breaking down the oats. All you have to do is process on high until oats are broken down. They won’t be as fine as flour and that’s okay. Leftover bananas? Perfect. But what if your banana isn’t brown enough? I roasted mine for about 10 minutes in the oven. I flipped it halfway through and it came out brown/black. This process ripens the banana and breaks the sugars down. I normally try and have a couple brown ones in the freezer that I have stashed away. 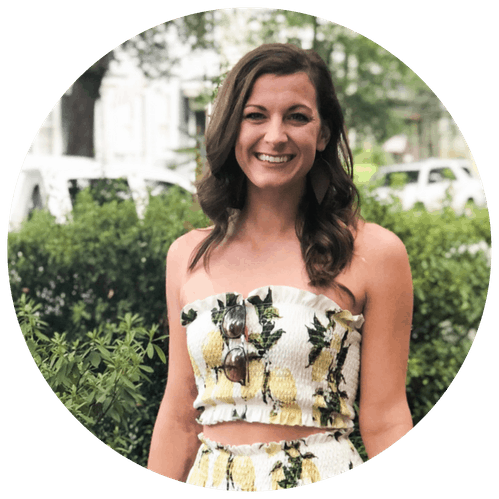 Peanut Butter: Can we have a moment for this brand Crazy Richards? Their peanut butter is 100% peanuts (exactly what you need) and the consistency is SOO creamy. It’s hard to resist not scooping by the spoonful. 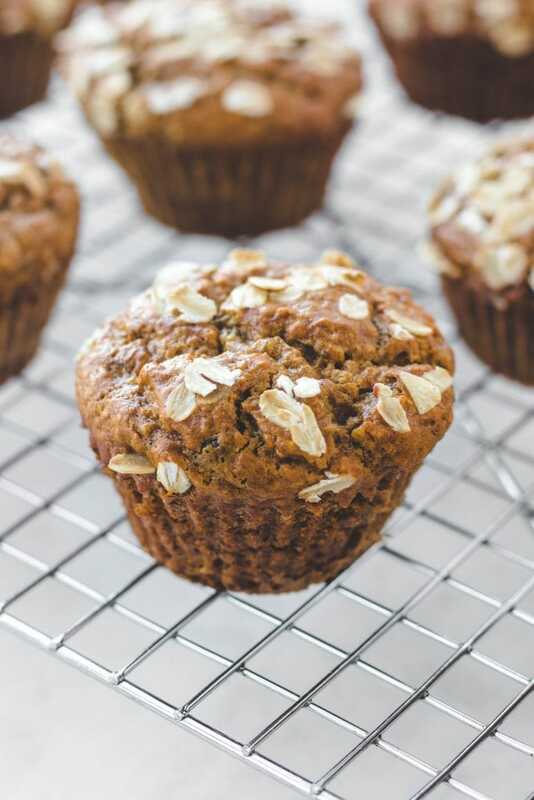 Rolled oats: If you do happen to have oat flour on hand, you will need 3/4 cup + 1.5 tablespoons. 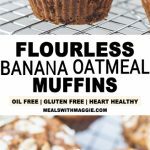 Know what else I love about these flourless banana oatmeal muffins? It’s that they are low in sugar. There is only 1/4 cup of honey in one batch, which is a dozen and they have natural occurring sugar from the banana. They are a little darker than your average muffin because honey darkens as you bake it. These muffins are so moist, soft and tender. The milled oats gives it a great whole grain texture without drying them out. 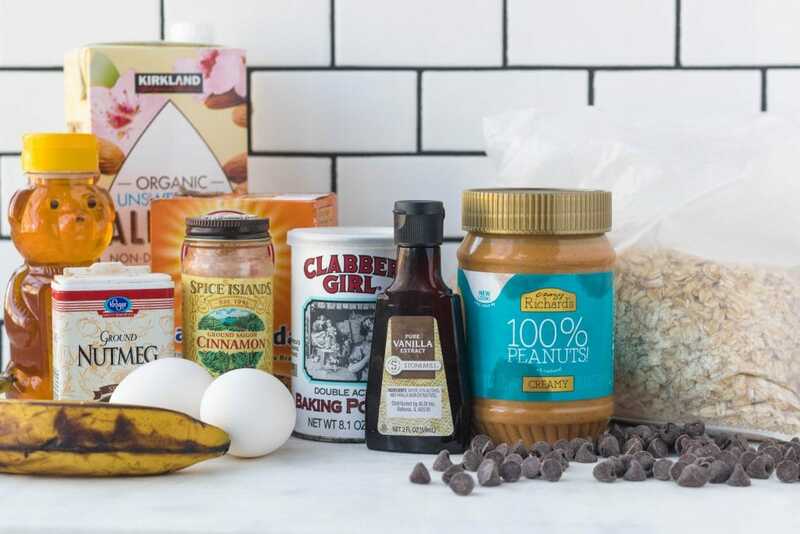 Have extra rolled oats on hand? Check out my simple chocolate chip pumpkin oat bread. These muffins were delicious! I made them for my grandson after school and he ate them up! Thank you Galina! I’m so happy your grandson enjoys them! Loved how moist these muffins are! The oat flour is wonderful! 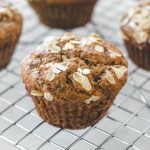 They are the first peanut butter muffins I have ever made and my kids want them again this weekend. 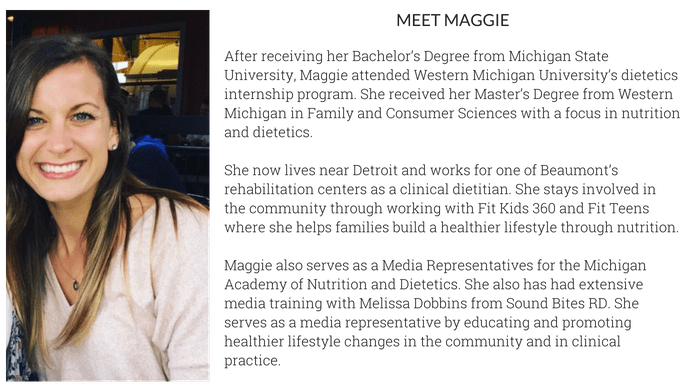 Great job Maggie! Thank you Lora! I love that you kids love them!